Sunday Funnies: For Elizabeth Warren #MASen And Washington Redskins Fans! And ESPECIALLY FANS OF THE WASHINGTON REDSKINS! This entry was posted in Political Jesus and tagged college sports, First Nations peoples, pro sports, Sunday funnies on September 23, 2012 by Rod T.
I have to get some things off my chest. I love Team USA basketball, Gabby Douglas, and Serena Williams like all of America does, but let me be clear hear. The Olympic Games, from the Opening ceremonies to the Closing, no matter which country is hosting them, is an event in militarism, nationalism and corporatism all rolled up into one. Think about this. For the umteenth time during the closing ceremonies, Bob Costas and Matt Lauer wonder aloud, see how wonderful it is that all of us countries are getting together to play nice. Shouldn’t we all be as one like that John Lennon song? To this, I must add a Barthian emphatic NO! First of all, under whose terms and agreements are the, what 7 billion people of the world going to assent to be unified? As I watched the Olympics in limited but critical fashion, I did some wondering of my own: “Why were Bob Costas and Matt Lauer the voices for America at NBC?” It certainly was not their vast knowledge of world history! The Olympics are products dedicated to hegemony. Everyone must conform to this or that standard, and hey, look everybody, we now have peace! It’s not the Olympics themselves I find offensive, it is the mythology behind it: the idea that humanity work together to create some peaceful utopian society, without there ever having been any sort of conflict. In short, nations have to continually lie to each other, as if somethings never happened, oh, like colonialism (hey, let’s laugh at that white British guy dancing with those Indians! ), and that international political bodies such as the United Nations and the International Olympics Committee do not have biases against non-western nations (a round of applause for China everyone, everyone–and you still can’t read this blog when you’re in that country, just a friendly reminder). Also, I just wonder what Britain’s military had to do with the Olympics. I thought we were celebrating peace and harmony and all that jazz? Do we really need to have Two-Thirds world countries like Afghanistan and Iraq see vivid memories of their occupiers? The one good thing out of this year’s Olympics was that women were represented from every participating country. The bad news? The Spice Girls felt it was time for a reunion. #FAIL. The performers at this year’s games were a tribute to how successful really good agents are. To see how extreme “patriots” get for the Olympics, how about that guy from Fox News, you know, when the USA won in women’s gymnastics. What was his commentary? Gabby Douglas and her friends aren’t patriotic enough. Really? Really? Do you think someone is over-compensating a bit too much? Thanks David Webb, that’s a real tea-bagging douche canoe thing to say! The sad part in all of this is that David Webb was named after the guy the government changed into Jason Bourne. Fox New, proudly patriotic once more, displayed the best taste when discussing Serena Williams’ C-Walk after her victory. She can never be a patriot in their eyes cuz she’s black, but she can be criticized for being a thug: Thanks Fox News, now I know what the Olympics are all about. So, Gabby Douglas’ hair isn’t like white people’s, she’s not patriotic enough, and she talks about Jesus too much. I think the latter speaks for itself. If you talk about Jesus, you have the means of resisting nationalism, hero worship and consumerism. Especially since Christ defeated the Gods of Mount Olympus! Hey, but no worries. Everything is peachy-keen, and a-okay! Now back to your delayed-scheduled t.v. programming. This entry was posted in Political Jesus and tagged college sports, nationalism, olympics, patriotism, pro sports, sports, United Nations on August 14, 2012 by Rod T.
In high school, I used to run from my Geekiness because I wanted to fit in with everyone. But ever since I was young, I was a geek. First introduced to Star Wars by my parents (who weren’t into science fiction), then RoboCop, yes, ah RoboCop was my small obsession. 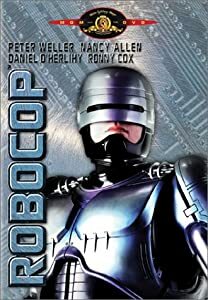 I loved the movie, the cartoon every Saturday morning, and even in the 5th grade, I had a RoboCop figure, gun and all. I recently watched that movie again, and found 2 interesting things. First, that film has a lot of F-bombs in it. Second, interesting fact I learned in the past couple of days via Twitter and Wikipedia (I trust Twitter friends a whole lot more) that Paul Verhoeven, RoboCop’s director, is a member of The Jesus Seminar (no comment) and claims that RoboCop is an American Jesus. I do recall a story of Jesus in Galilee, walk into a corporation’s headquarters, and shooting it’s CEO 30 feet out the window. Yeah, it’s in Mark 27, I believe. Oh, and I cannot wait for the RoboCop Reboot! All kidding aside, at a summer camp, I came to discover I was a Bible nerd as well. I knew a lot of passages, and won a competition. Besides geeking out to Scripture, I also have always been a big Politics Geek. I was at my worst in Undergrad, reading political biographies, minoring in poli sci, fanning out to The West Wing (Jed Bartlett is my President! ), watching Fox News and CNN almost constantly, oh and hanging out at a political website, commenting and philosophizing. Then, in seminary, I got it bad for Theology, which I found was way more fun than Religious studies. I always carried a Jurgen Moltmann book with me and there was a Facebook group I always was arguing with someone about. In short, Theology rocks! I never have been that athletic, but I did, and still do keep up with sports trivia and my favorite teams. Go Go White Sox. Perhaps one of the most helpful things about me embracing my nerdiness has been the television show COMMUNITY, and how I get all of their pop culture references, and if I can do so, then what does that say about me, except that I am a geek too. Always have been. It is for this reason I understand the outrage of many Black Comic geeks like this blogger. Is genre of Fantasy an escape away from the Colored Threats to white society? Not all of Fantasy is like this, but the typical medieval settings with dark skinned savages have me asking questions. These thoughts constantly haunt me as I am now reading A Game Of Thrones by George R.R. Martin. How do you cope with a genre that hates you or even worse, is apathetic towards people your skin color out of some notion of “The Market?” Community is an enjoyable show, but not without it’s problems and racist tropes. What show doesn’t? But why was there such a huge uproar about the Hunger Games film, and Rue and Cinna being casted as Black, but no word on Thresh, huh? Just how transgressive would it be for Jesse Williams as Finnick Odairin the Hunger Games sequel, Catching Fire? When it comes to science fiction/comic book/geek culture, its sad to see that there will not be any enthusiasm for a minority lead or written products as there has been for comics & novels for the GLBTQ community. I guess that’s why I remain cynical, and suspicious, and I guess that part of consumerism’s racist legacy too. This entry was posted in Political Jesus and tagged bibliobloggers, Blerd, blogging, Canada, college sports, comic books, DC Comics, Marvel Comics, political theology, politics, pro sports, science fiction, the Academy, the Bible on May 27, 2012 by Rod T.